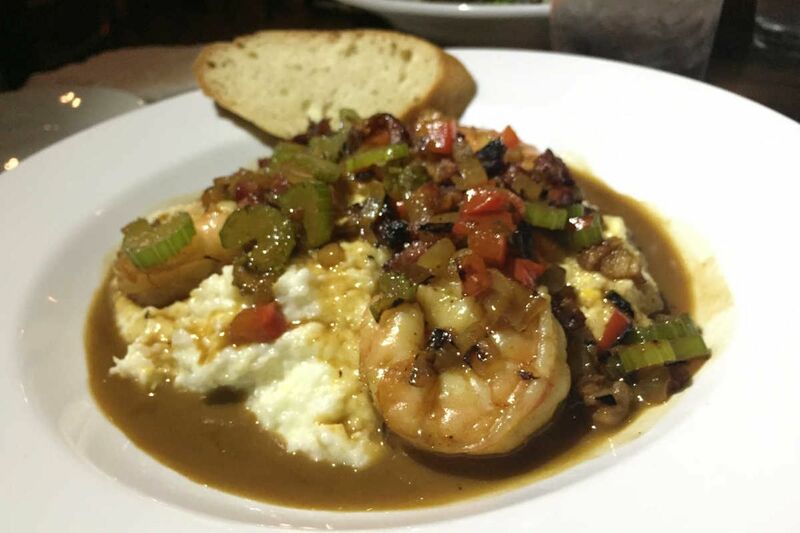 Shrimp and grits from St. Benjamin's Taproom.. The pace of brewpubs opening inside the city limits is starting to quicken, and the new taproom at Kensington's St. Benjamin's Brewing Co., on Fifth Street just north of Cecil B. Moore Avenue, is serving up food that goes well beyond your typical tasting-room fare. Set into the handsomely rehabbed confines of the former carriage house of the 19th-century Theo. Finkenauer Lager Beer Co., the kitchen run by chef Michael Budzilowizc (ex-Rouge, Devil's Alley), features food mostly made from scratch, including house-baked breads. It's also extensively using the beers - and in particular, St. Benjamin's malty, dark English, mild Foul Weather Jack. The Jack is key to the irresistible comfort of the brisket melt sandwich, whose beer braise gets a boost from the addition of smoked malts. But the Jack is surprisingly effective with seafood, too. It adds an earthy, chocolaty splash to deglaze the pan of rustic andouille and tasso gravy that pools around the tender shrimp and cheddar grits - good for dinner or a hearty brunch.